Hardening of arteries is referred to as atherosclerosis. Atherosclerosis occurs when arterial walls thicken, for example, due to laying down of fat, cholesterol and other substances, and restrict the flow of blood. Atherosclerosis also occurs due to constant wear and tear in the vessels and a process of inflammation that subsequently goes on there. Many risk factors are associated with atherosclerosis that may increase the rate at which arterial walls thicken. Moreover, atherosclerosis along different vessels presents differently. For example, if it occurs in the vessels of the heart, it causes heart pain (angina) and eventually a heart attack. If atherosclerosis occurs in the vessels of the brain, it causes a stroke. High blood cholesterol and fat—especially LDL is laid down in the arterial wall and forms plaques. Over time, these plaques impede the flow of blood through the vessels, and cause disease. If these plaques break off, they flow along the blood and lodge in narrow arteries, cutting the blood flow there completely. An example of this is seen in case of a myocardial infarction or a heart attack, where a plaque cuts off the blood supply in the coronary arteries and blocks blood supply to the heart muscle. The nicotine in the cigarette, as well as the other components of smoke, irritate the walls of the arteries and induce an inflammatory process over there. A vicious circle of excessive inflammation and wear and tear ensues, thus narrowing the radius of the vessel, hardening it and impeding blood flow along the vessel as well. The result is hypertension, atherosclerosis, and peripheral arterial disease. Therefore, smoking if combined with other risk factors of atherosclerosis, like high cholesterol pose a big risk for a heart attack and other arterial diseases. The rate of atherosclerosis in diabetics is nearly four times more. 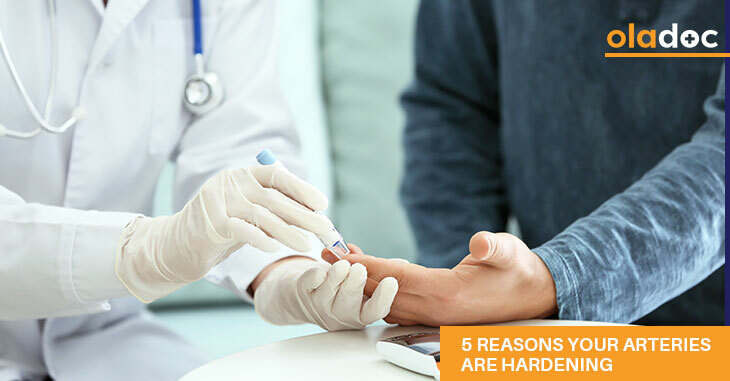 This is because high blood glucose damages the arterial wall directly as well as indirectly. High blood glucose drives the glycosylation reactions which damage the inner walls of the vessels and induces inflammation and cell damage there. Furthermore, diabetes increases free radical damage in the blood vessels. When free radicals damage the innermost cells of arteries, then nitric oxide cannot be produced that dilates the blood vessels. Consequently, blood vessels remain narrowed and blood flow is restricted. When blood hits the walls of the arteries with higher pressure, it damages them, and causes a cycle of inflammation and repair. This inflammation results in narrowed and thickened vessel wall that cannot regulate the flow of blood. In stage 1 hypertension, the blood pressure is in the ranges 130-139/80-89. In stage 2 hypertension, the blood pressure is more than 140/90. Atherosclerosis occurs commonly due to aging as well. As we grow older, the arteries harden and lose their ability to control blood flow over time. The result is atherosclerosis as well as hypertension. In conclusion, hardening of vessels or atherosclerosis is the basis of many other diseases and must be dealt with. If you are suffering from any of the above-mentioned risk factors of atherosclerosis then be sure to book an appointment with a top cardiologist in Lahore, Karachi, and Islamabad through oladoc.com, or call our helpline at 042-3890-0939 for assistance to find the RIGHT doctor for your concerns.